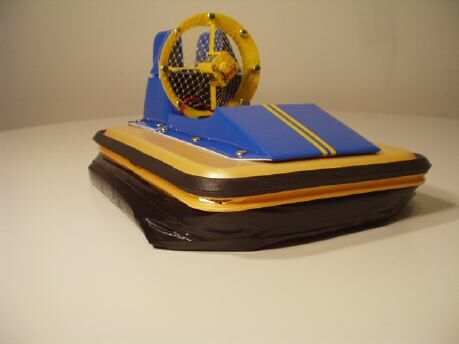 The GH-1 hovercraft is an affordable introduction to model hovercrafting! It works very well on smooth floors and other flat hard surfaces such as finished driveways and playgrounds. The GH-1 kit comes with a detachable skirt. Add the skirt and your GH-1 will glide over obstacles that it would have stopped it otherwise. Indoors, the skirt will help the GH-1 negotiate doorway transoms and carpets. Outdoors, the skirt will help the craft fly over bumpy pavement. The one piece skirt is easy to assemble and attach to the craft. 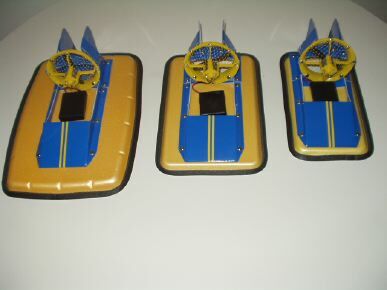 It detaches in seconds for "pure hovering" and can be reattached quickly as well. The GH-1 kit comes the materials you need to make a "wave hopping bow". In general, your GH-1 won't work well on water. 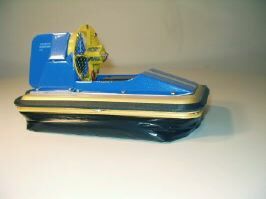 Water isn't perfectly flat and waves tend to splash over the front of the craft. Due to the low power levels and small size of the GH-1, the craft can't bounce back from a splash and instead "plows in". 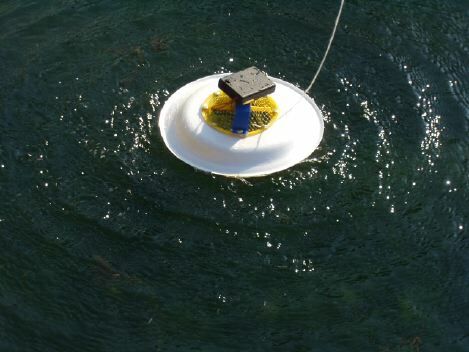 You can improve your GH-1's performance on water by adding a bow which will enable the GH-1 to hop over waves instead of crashing through them. This attachment will also help the craft hop over small obstacles on land. Unlike any other aspect of the GH-1 kit, this optional attachment does require some work with a hobby knife. Also note that there is really no getting around it -- the GH-1 isn't particularly impressive on water. For great performance on water, with a no-tools assembly, try the GH-2! 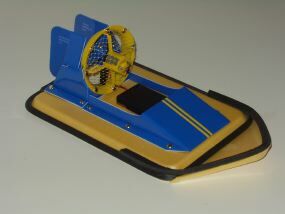 The GH-1 kit lets you build other kinds of hovercraft. The GH-1 kit includes the parts you need to a flying saucer. All kits come with a simple rectangular "battery perch" that lets the battery holder sit on top of the plastic duct. 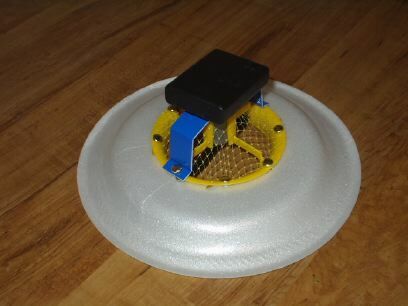 Remove the duct from your GH-1, take any picnic plate (one is included with your kit) and combine them with the battery perch to form a "GH-0" flying saucer. 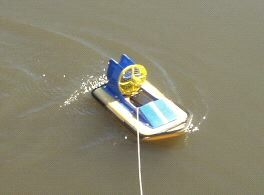 Fly it on land or water. 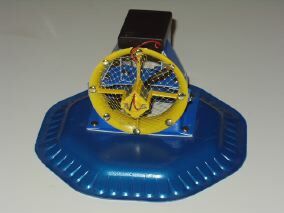 The GH-1 and the Flying Saucer aren't the only models you can construct with the parts from a GH-1 kit. 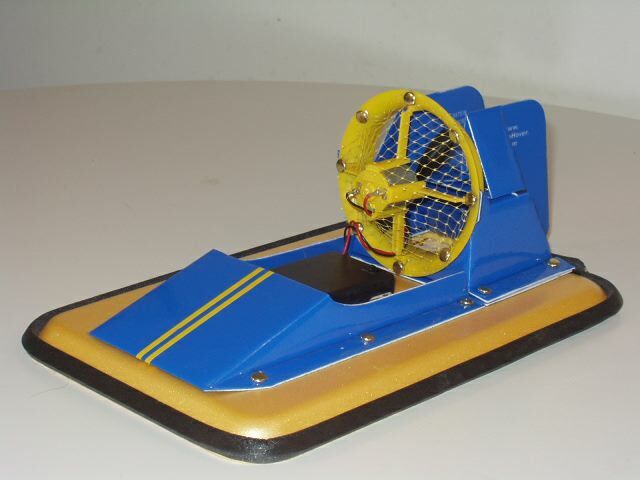 Look at the designs with one duct in the "Design Your Own Hovercraft" Section for more ideas on the designs you can build with the parts from your GH-1 kit. The GH-1 kit requires 4 AAA size NiMh rechargeable batteries.